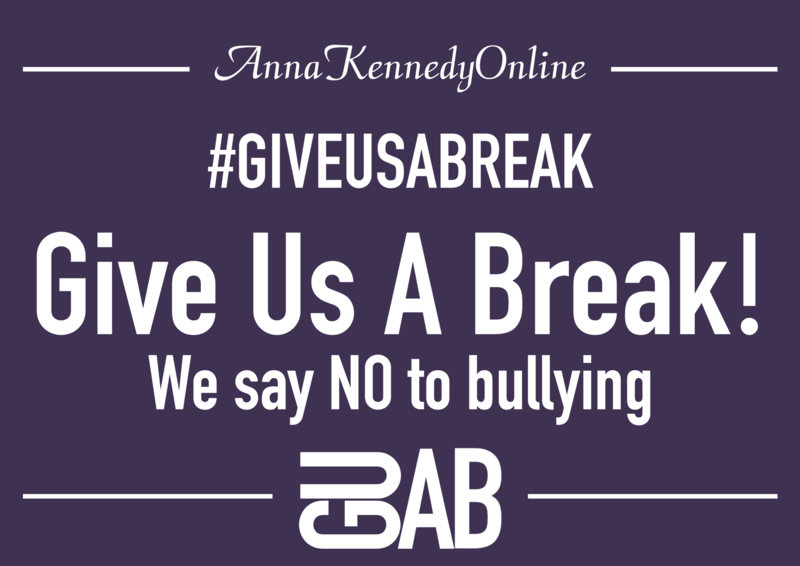 For the last few years during National Anti Bullying Week our Give Us A Break is an national ongoing campaign that Anna Kennedy Online continue to highlight. Bullying affects so many children and adults and the results can be damaging for them and everyone around them. If you are suffering, speak up, and if you see it, stand up to it. Please share, even if this makes a difference to one person. Anna Kennedy Online once again call on all schools and colleges to be particularly aware of the bullying that children and individuals on the Autism spectrum experience at break times and to provide positive activities that keep them safe. For children and young people with autism, break and lunch times in schools and colleges can be particularly daunting and can put them at risk of bullying. Anna Kennedy Online, the UK Charity, is to continue raising awareness, and training on autism, to prevent bullying of children with autism in our schools and colleges with our campaign ‘Give us a Break!’ Too often these children are seen as the problem; as not ‘fitting in’ or ‘not settling down’. We want to see all schools take decisive action to create environments and cultures where all children feel safe and supported without the fear of bullying at schools, cyber bullying, and within the community. There have been some horrific cases in the media and we as a Charity continue to campaign to raise awareness with this growing concern exacerbated further by mate crime, cyber bullying, which has led to some tragic outcomes. We have great support and some inspiring videos which can be seen below. If you would like to spread the word of our Give Us A Break campaign please click here to download the poster print off and please take a photograph of yourself and email it to us, so we can share your support. Please share and let us make a change – together we are stronger! Please take a look at our video campaigns, which are all very powerful and sent out the same message: Give Us A Break! Dani Bowman one of our AKO Charity Overseas Ambassadors supporting and spreading the word for our Charity ‘Give us a break! Anti Bullying Campaign’. Give Us A Break 2016 Anti Bullying Week where so much support was received by some wonderful people, and this video was created. Anna Kennedy met with UB40 in 2015 and who were amazing in supporting Give Us A Break, Anti Bullying Campaign and created this video in support of this campaign. Anna Kennedy Online launched this Charity single with our ambassador Macauley Elvin called ‘Hollow’ for 99p which was supported by ‘Blue’ for and hope we can help families affected. All funds from this song will go to Anna Kennedy Online, click here to purchase your copy. Charity Patron Ryan Wiggins created a powerful video called ‘Tomorrow’ which was shared across National Newspapers online and went viral on Youtube with almost 400 000 views and went viral. Diagnosed with Asperger Syndrome at the age of ten, Ryan has been consistently bullied at school ever since he can remember, for being ‘different’.In the black and white footage the camera follows Ryan through a typical day, from waking up in the morning to going to bed at night, with his own voice providing the commentary and a moving insight into the trauma he faces on a daily basis.